Nintendo’s got you covered! Purchase the Nintendo 3DS version of the newest Super Smash Bros. and you’ll get the game’s soundtrack for free! Plus, you’ll also score an entirely new and original way to listen to your favorite tunes. Just simply close the Nintendo 3DS to put it into”Play in Sleep Mode,” and you’ll be able to shuffle through the game’s tunes with the L and R buttons. Opening the 3DS will lo give you information regarding the composer or whether it is a remixed track specifically for Super Smash Bros. or a piece of music from the original game. Director Masahiro Sakurai explains on his Miiverse account. The 3DS version has an excellent Sounds collection! The design looks nice for a sound test screen, doesn’t it? 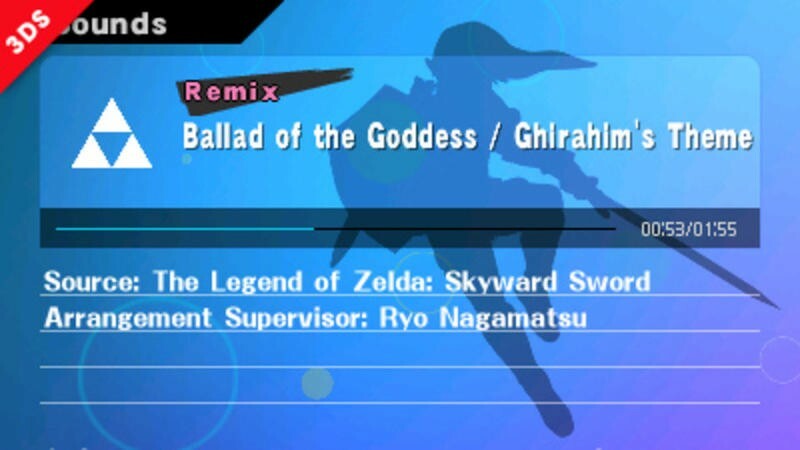 The font color for the “Remix” text on remixed songs comes in pink or white. The pink ones are songs arranged for this version of Super Smash Bros., while the white ones are remixes made in earlier Smash Bros. games. This means there are reoccuring songs from past releases. Not the most earth shattering update that Super Smash Bros. could have gotten, but a sweet little addition none-the-less. The Nintendo 3DS version of Super Smash. Bros. will be released on October 3rd, and the Wii U version will follow shortly later in the holiday.